Severe storms that brought tornadoes, wind gusts, hail and rain caused some damage around the area Sunday night. Haskell County experienced the most damage and rainfall from Sunday night’s storms. Haskell County Sheriff Troy Briggs said that some farmers in Haskell County have significant crop damage. He said that the severe weather and precipitation is expected to subside, though, leaving the crops plenty of time to dry out. Briggs said the precipitation still is welcome right now because some of the wheat is still green and absorbing moisture. He said that large amounts of rainfall are only unwelcome right before harvest, when seeds need time to dry out. 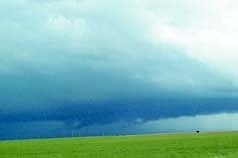 Sunday night, the National Weather Service in Dodge City had five reports of tornado sightings. The first came at 5:23 p.m. northeast of Ryus in Haskell County. Two minutes later, a trained spotter saw a tornado six miles west of Sublette. Law enforcement officers spotted a tornado eight miles north of Satanta at the same time. The tornado dissipated at 5:30 p.m. Wind gusts from the tornadoes tore down branches and blew cars into ditches, but no injuries were reported, according to Briggs. A trained spotter reported three-quarter-inch hail north of Big Bow in Stanton County. A county official recorded .88-inch hail seven miles east of Johnson City. Law enforcement had reports that roofs were blown off houses along Kansas Highway 144. Wind gusts reached 70 mph. Briggs said Sublette Feeders lost a roof off a scale house and had damage to a hay barn and horse barn. A leg was blown from a grain elevator and other equipment was damaged at Sublette Feeders, according to a report released by NWS in Dodge City. Near Tice in Haskell County, two power poles were blown down after they snapped off the base, according to a spotter. Briggs said Southern Pioneer Electric Co. had some power outages but as of this morning, most electricity had come back on. Several center pivot irrigation systems were blown over about a mile north of Copeland in Gray County. Wind gusts at 60 mph turned over two horse trailers and tree limbs blew down onto houses. Rainfall totaled 1.04 inches three miles northeast of Ulysses, 1.03 inches eight miles west of Ulysses and .76 inches eight miles northeast of Hickok, according to the National Weather Service.